... The only wax injector designed to run rubber and metal molds. The MPI 75-300 can be used as a low pressure rubber mold injector, or as a medium pressure metal mold injector. The vacuum evacuation of the rubber mold is consistent every time. The entire mold is placed in the evacuation chamber. No need to rely on a perfect nozzle to mold vacuum seal. Now rubber molds can be designed with vacuum vents never before possible with nozzle evacuation systems. The MPI 75-300 is designed to dramatically increase both the quality and quantity of your wax patterns. Its innovative design and high-performance are the result of advanced technology, developed by MPI incorporated, the leader in wax injection technology for over 30 years. The MPI 75-300 advanced operating system sets the standard to the jewelry industry. We are confident our new rubber and metal mold wax injector will improve your bottom line. Mold to nozzle alignment, vertical and horizontal, is quick and accurate. Vertical mold alignment using height adapter platens, allowing for nozzle height adjustment from .5″ to 1.25″ (12.7 – 31.8mm) in increments of .125″ (3.18mm). Custom height platens are available. Molds are aligned horizontally by guide strip on top of the platen. Operator selects vacuum or non-vacuum modes. Vacuum mode cycle starts automatically when the chamber door is closed. Non-vacuum cycle is started when chamber door is closed and start button is pressed. Automatic cycle of clamp, inject and unclamp, with or without vacuum. Controls for wax temperature at reservoir and nozzle, injection pressure, wax flow control, cycle time, clamp pressure and selection of a vacuum or non-vacuum cycle are upfront, easy to read and simple to adjust. Built in removable wax melter means much better patterns and shorter cycle times. 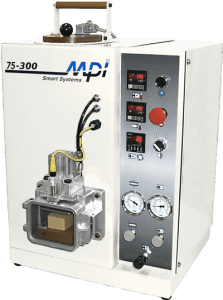 The MPI 75-300 wax reservoir top loading wax melter, eliminates the need for pre-melting wax or waiting to come to operating temperature. The wax melter is easily removable for wax change over and clean out. A wax reservoir drain is supplied standard. Controls for wax temeperature at resevoir and nozzle, injection pressure, wax flow control, cycle time, clamp pressure and selection of a vacuum or non-vacuum cycle are upfront, easy to read and simple to adjust.